The State Council of the People Republic of China has confirmed that Russia will also become a founding member of the bank. A number of leading European economies have also applied to becoming founding members, including Germany, France and the UK. Japan has decided not to apply, saying it would want the terms of joining to include establishing lending rules with due account for social consequences plus certain guarantees on transparency. Tokyo however said it may join in the future. Washington was first skeptical of the emerging bank, seeing it as a rival of the US-led World Bank, the International Monetary Fund (IMF), and the Manila-based Asian Development Bank (ADB), which is dominated by Japan and the US. 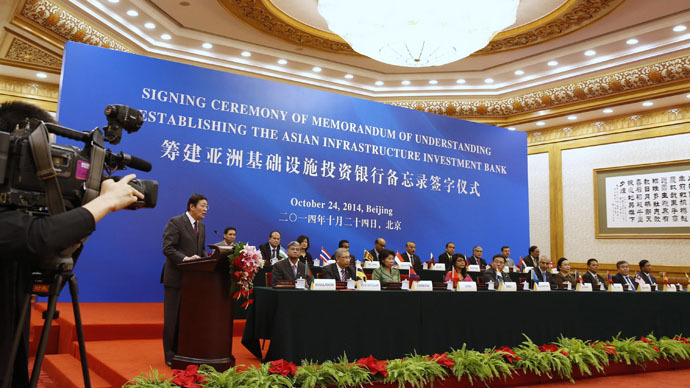 The AIIB was established by China in 2014 and had an initial subscribed capital of $50 billion, which is planned to be increased to $100 billion.